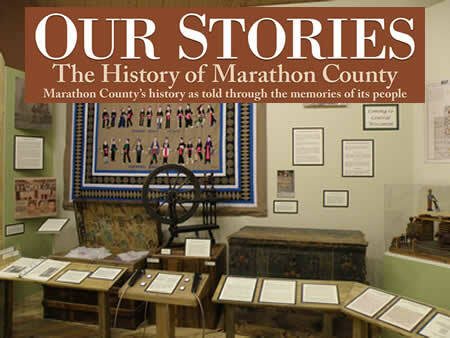 Take a journey through our permanent exhibit on the history of Marathon County and you will learn about the many people and events that have made us what we are today. The exhibit is focused on the stories of the people who have lived here, highlighting three themes. The first theme, “Arriving Here” introduces the visitor to some of the past and present residents of Marathon County – Native Americans, immigrants from past centuries and recent arrivals. “Making a Living” covers a variety of ways our residents have earned their living, from logging and farming to modern businesses and industries. “Having Fun” highlights the many ways we enjoyed our leisure time, including musical and theatrical entertainment, taverns, county fairs, family fun and sports. Each exhibit theme is presented through artifacts, photographs, biographies, quotes and audio excerpts from local residents. There is also an interactive computer where people can look up information on towns in Marathon County, many of which no longer remain. Find out when each town was founded and read stories about some of the residents. At the end of the exhibit, visitors are invited to leave their own stories.